Doesn't that theme just get you excited for Science Week? To me it's all about STEM, innovation, inquiry, investigations and experiments. We want to encourage our students to think outside the box, use their creativity and push the boundaries of what they already know and take for granted. Science Week 2018 takes place of the week between 11th and 19th of August right around Australia. Some schools might choose to do lunch time activities in the Science labs, buddy class activities, rotations around the school or simply make extra time in their timetables for some super fun Science activities within their own classrooms. 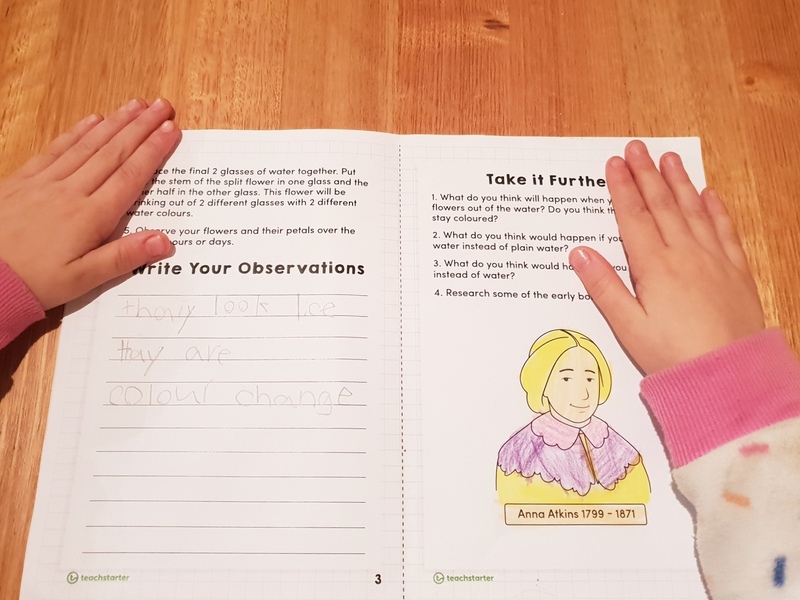 To help us all prepare for Science Week, the Teach Starter team has put together three mini Science experiment books, relating to three of the key scientific learning areas in the Australian Curriculum. 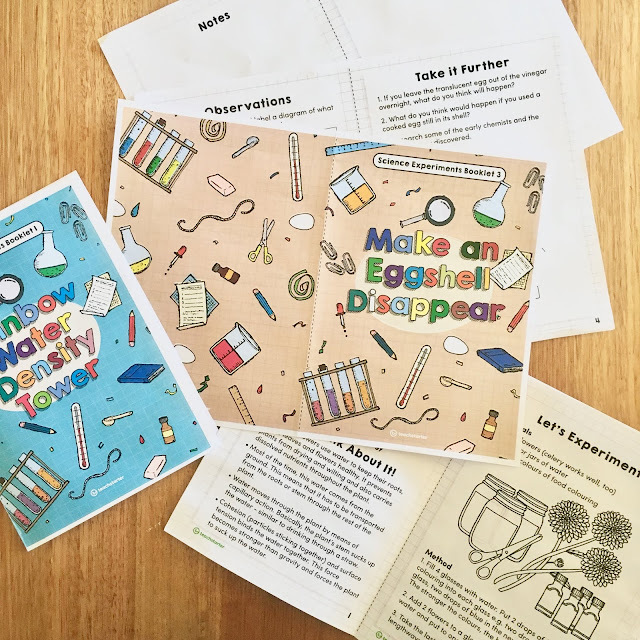 Kids love having their own mini books to record their findings and then take home to show their parents - maybe even to recreate the experiments at home! To make the books simply print out each page (four in total), fold them down the centre, arrange the pages in order and then glue them together - back to back. I started with the front cover first, then the back cover, and finally glued the middle pages together. Our Science theme for Term 3 in Early Years is "On the move" where we look at push and pull, rolling, sliding, spinning, swinging and bouncing. We were actually planning to do this egg experiment already. The bouncing egg is such a classic and simple experiment for all ages (and relates to the area of Chemistry). I'll be sure to report back on Insta with how it goes. If you're already a Teach Starter member, download the mini experiment book here (and if you're not - I highly recommend that you join up!). You may remember earlier in the term we did the colourful flowers experiment - although it took me two attempts to get it to work (isn't that what experimenting is all about?). It seems that different types of flowers work better than others. Might be a good idea to test it out at home first, or try a few different types of flowers at school. Here's the link to the colourful flowers experiment booklet, relating to the area of Biology. 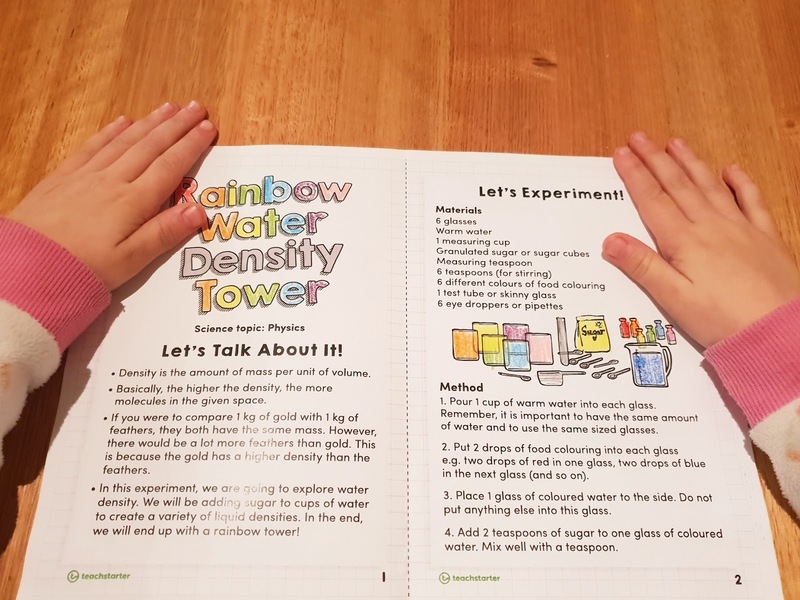 I've always wanted to try the rainbow water density experiment - so what better time than Science Week? I'm really interested to see how it turns out with this method. The one I've previously seen used different types of liquids (e.g. oil) to create the colours. But this one uses different amounts of sugar added to the coloured water to change the density (Physics in action!). Once again I'll make sure I report back with the results! 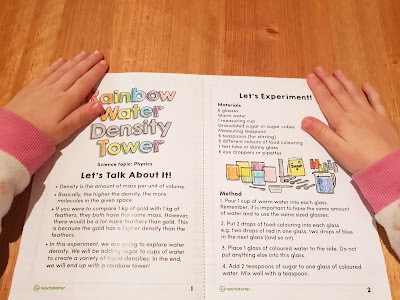 Get the booklet for this cool experiment here! Ever heard of a Thaumatrope? Check it out here! 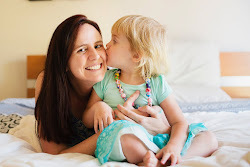 Well there's still a few weeks to prepare but I hope some of these ideas have given you a bit of inspiration of how you can incorporate more fun Science into your Science Week this year. What's coming up next? Book Week! Literacy + Numeracy Week! Busy times ahead.